I love the word resonate, especially when used in the context of your website. 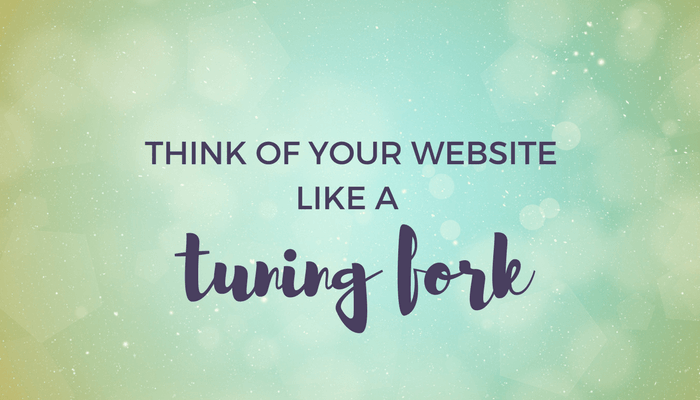 Think of your website like a tuning fork. When your target audience lands on your site your message needs to resonate with them. Here’s the thing: when you start resonating with people, they resonate back. That is the secret sauce to an effective website; the first step to starting a meaningful relationship with your website visitors when they land on your site for the first time. Remember, your frequency will resonate with certain people, and not others. That is the goal. You don’t want your website to be a megaphone blasting your message to as many people as possible. Find the people who are looking for you and fit your message to them. So, how do you create a message that resonates with your audience? Understand your audience, really understand them. Know what they care about; their pain, desires, hopes, fears, uncertainties and doubts. What is their previous experience of your product/service, and others like it? What really motivates them? What are the problems that they need to solve? The key to how you speak to your website visitors lies in the answer to those questions. Your content should be 100% focused on what you KNOW about your visitors. When you can create a home page that speaks directly to THEM, your website visitors, you'll get their attention. They'll be more engaged, more receptive and feel more confident that they're going to find what they came looking for on your website. Question: Is your message resonating with your website visitors?